Chatbots are all the rage these days with both Facebook and Microsoft staking part (in Facebook's case) or a lot (Microsoft) of their reputation on the potential services able to be provided by chatbots. There have been rumors that Google was also working on a messaging app that would use chatbots, but Google has a messy history with making its messaging apps popular. So, the latest rumor is that Google will be providing developer tools and integration support for chatbots in a more general sense. For those of you out of the loop, chatbots are essentially ways to integrate various services into a messaging platform. In practice, it's the logical progression of the voice-powered assistants that we know and love. Where you can ask Google Now or Siri for information or help with tasks, chatbots extend that to businesses and more services. So, you could ask a chatbot to book a hotel, order food or products to be delivered and more. Many think chatbots are going to be the next big thing in software, and Google obviously doesn't want to be left out. 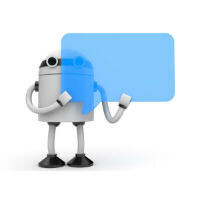 A new report says Google is working on a developer platform for chatbots, including developer tools. The theory is that even if Google can't get its rumored chatbot messaging app to take off, it can still be part of the system (and therefore get access to the user data) by building the platform side. So, it could be that Google would run the backend of chatbot services that integrate with third-party apps, but an educated guess would say that the tools and platform Google is planning would integrate with Hangouts, or could even be built into Google Now to extend the features of voice-powered commands. This makes even more sense when you consider the rumors that Google is planning a competitor to the Amazon Echo, which offers some similar features through open APIs. It's possible, but not confirmed, that we could find out more about Google's plans on this at Google I/O. If we do, we'll let you know. But what will they use the chat bots on? Hangouts?